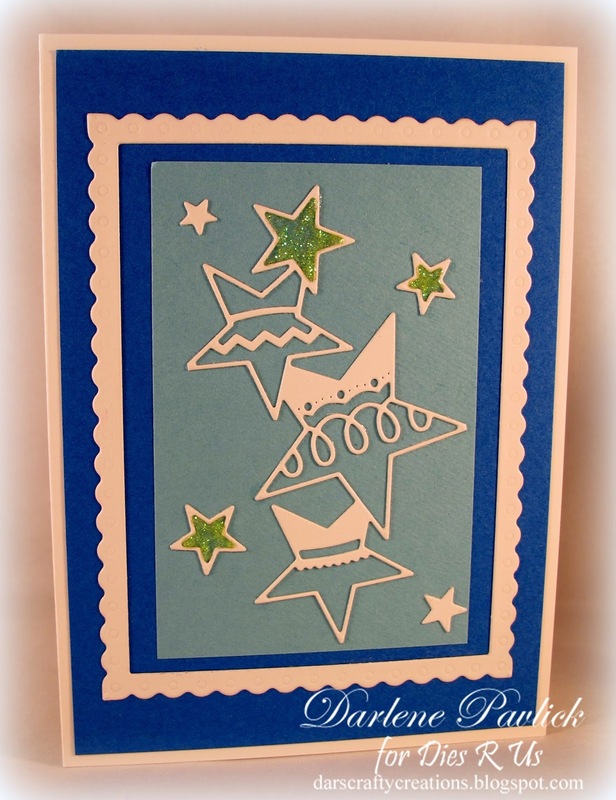 Dies R Us: You're A Star! 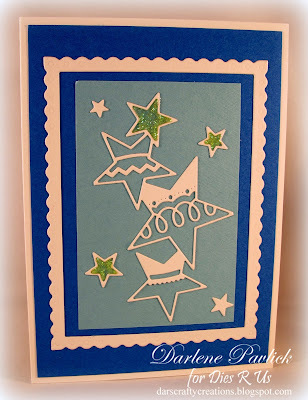 Darlene with you today sharing another easy peasy creation using dies from our Dies R Us Store! It appears team mate Leslie and I are both in love with this Impression Obsession Rectangle 6-in-1 Frames die set! I shared a couple of cards using this set with you last Friday, Leslie showcased a card using it on Monday and here I am again today with yet another card using this VERY versatile die set. The other die set used on the creation of this card is Poppystamps 'Stacked Stars' #POPPY-1306 which unfortunately is Out of Stock at the present time but there are SO MANY other die cuts you could use in it's place. For instance, how about changing the colors to red, white & green and use the Poppystamps 'Stacked Stockings' #POPPY-1328! That would make a quick, easy and awesome holiday card! Dies are coming and going QUICKLY at the store so be sure to get your order placed while supplies last! And, you can stay on top of any Sales ... New Companies ... Special limited time discounts being offered by receiving our newsletter. When you click into the store site, the option to sign up for the newsletter will pop up ... be sure to take a minute and fill out the quick form so you don't miss out!!! we need to take advantage of those sales where ever we can! Don't forget to come join in our challenge fun! A new challenge theme is posted on the 1st & 15th of each month and one lucky winner will receive a gift voucher to the Dies R Us Store! That could be YOU!! I'll be back Tuesday with another inspiration sample to share! Winter is coming ... uugh!